Merci Beaucoup! Glad you enjoyed your stay. 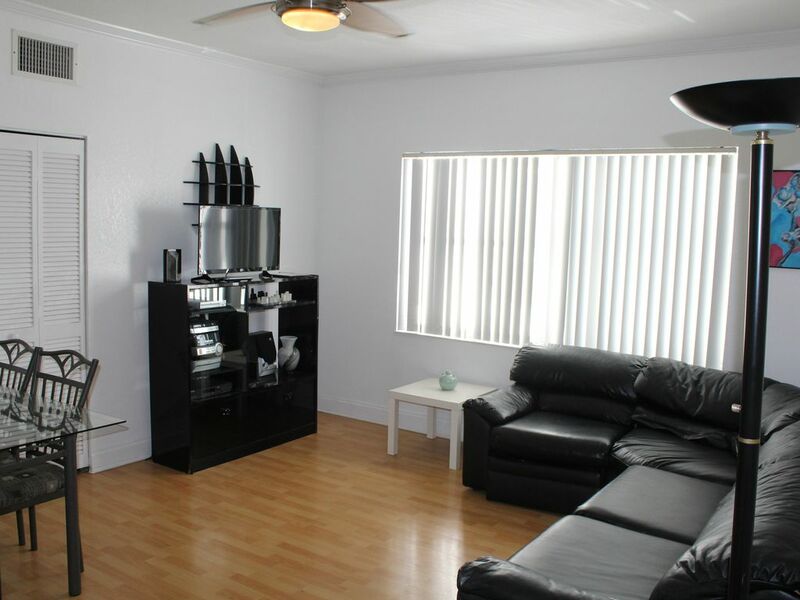 If you're looking for easy access to the beach in a very walkable area, this is a great apartment. It's very simply decorated but seemed to have all the regular amenities one would need, as well as beach chairs and a beach umbrella. Very helpful to have those! It's not luxurious but for the price we paid, we got value for our money. Roger responded quickly to any inquiries I sent him and the entry instructions were clear and easy. The only thing I'd change would be to either put a mattress topper on the mattress or to change it. Overall, I'd recommend this apartment. Let's start by saying we were very put off by the unsavory looking people waiting for the bus outside of the condo. Which we understand you can't help where the city decides to put his stops. The elevator was terrifying bc it was so small. The actual condo was very nice except for the shower was stopped up and took forever to drain. Finally there was the huge matter of parking. In the description of the property it stated that there was parking available. It failed to mention that you would have to carry ALL of your belongings 9 blocks away from a parking garage, or try to find parking at a paid parking lot down the street where you can only stay for a maximum of 3 hours. Not happy with this trip at all. Don't see us ever going back to Miami after this experience. Wow! Welcome to South Beach! I specifically told you prior we don’t have parking. I explained your option 9 blocks away but also there is a free trolley to get you around after droppping all your bags at the front door. Not sure why parking was and issue as I think you flew but you could have rented a car near by just for the days you needed. I’m glad you loved your stay besides the tub draining slowly but you never mentioned that while here I could have cleared it for you. I must say you had a great time as most people only point out the 20% negative and forget the wonderful time they had! Next time please clean up and be a cleaner guest! Not to even take 2 weeks of trash out is really bad! I am glad you are feeling at home and enjoying your stay! Thank you for visiting. Nice place- clean- do not understand the negative reviewsI read. Two details- there needs to be a front door key on the 2nd set of keys. Washer spin cycle is out of control- it starts banging shortly after spin cycle starts. Otherwise a great place especially for just 2 people. Owner helpful and available. Not sure the need for a second building key when it works with an entry code which I provide. I will look into the washing machine it’s never done that maybe it was over loaded. Thanks for staying with us!